Advanced global cellular Internet technology permits the delivery of high quality content throughout any cellular service provider coverage area. The CLS-140 solves the problem of the "Last Mile" bringing OTT, web browsing, social networking, streaming video and e-mail services to any household or business with cellular coverage. Use any standard television to view videos and Internet OTT Content. 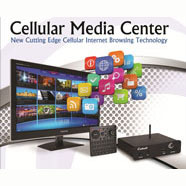 The CLS-140 and CLX-R01 QWERTY remote control combine to make this a full featured cellular network media center. Designed for use with any television the CLS-140 includes cables to connect via HDMI, S-Video or Composite Video with up to 1080p quality. Supports 480i/480p, 576 i/576p, 720p and 1080i/1080p and will connect with any analog television, PAL or NTSC. An audio line-out connector is available if analog TV is required. Watch high quality video content on a television using a cell signal. Video from Internet sources. Also play local content such as music, pictures and movies from USB port, HD or SD card slot. The CLS-140 Cellular Network Media Center is designed to deliver broadband media content from a teleco operator to individual users in countries and rural regions where lanline solutions do not exist or not cost effective. OTT Content, TVE - TV Everywhere, HD Video, Audio. 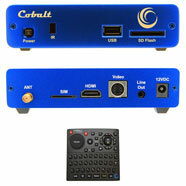 The CLS-140 platform has a full featured media center derived from XBMC and HTML5 browser. Browse the Internet, watch online content, email, access social media. 3G TVE, TV Everywhere. Internet on a TV using a 3G Cellular Network Connection. Full OTT Internet and Local Media Content on any TV for everyone, everywhere. OTT content for TVE.